While the move to British Summer Time (BST) at the weekend may have left us all a little sleepy I think we're all glad of that extra hour of daylight making evening brighter for the foreseeable! With the change in daylight hours, I personally like to make the mental shift to Spring with DIY projects on the horizon, day trips planned, a Spring clean in full process and of course a change to my makeup routine. For me, this means ditching full coverage foundations in place of lighter bases, fresher textures and finishes and of course a few new items to put a spring in my step. Below find out how I'm adding a touch of Spring into my makeup bag and how you can too. As a huge fan of fragrance a new scent really is a must for me to celebrate a new season. So if you are the same, finding a new scent that instantly makes you think of Spring is key. This means light floral notes with either a clean or warm base, depending on your personal preference. If you do plan to treat yourself come each new season then it's wise to only go for 30-50ml sizes. Personally, I adore a fresh floral scent with a slightly warm base so I've made my Spring scent Daisy Love by Marc Jacobs, which is beyond lovely. Unlikely Daisy by Marc Jacobs I can definitely smell a stronger daisy note within the fragrance along with a slightly fruity twist that adds an uplifting element. The base note is cashmere musk which while subtle gives this new fragrance a warmth like Spring sun on the skin, truly beautiful and delicate. Daisy Love is currently exclusive to World Duty Free until April 11th so if you are going on holiday anytime soon then this is the scent to pick up. But if you aren't then this is a fragrance to try once it reaches other stores. More Spring fragrance recommendations: Sarah Jessica Parker Lovely, Philosophy Amazing Grace, Guerlain Mon, Elie Saab Le Parfum and Viktor & Rolf Bonbon. For me, the cheeks are the main focus when it comes to Spring makeup as a fresh flush can really lift the face and make it glow. So it's out with any matte blushers you may have and in with any that have a slight sparkle or radiance to them! My latest love is Benefit Gold Rush, a warm golden-nectar blush, which I can see myself using throughout both Spring and Summer. Now, while the gold spray is gone in the first application (I wish Benefit would stop adding sprays to their products just for aesthetics) what is underneath is thankfully even prettier, with a golden peach blush with subtle gold flecks that I've found to be just as pretty on the eyes! This is shade perfect for pale to tanned skin to give a peachy glow, however, I would give it a miss if you have a darker skin tone as from swatches I've seen it looks more of an ashy highlight than anything else sadly. The blusher, for now, is exclusive to Cult Beauty here and really is one of the nicest Benefit box blushers I own. Oh, and did I mention it's vanilla scented! Staying in the realm of glow-y blushers I wanted to also shine a spotlight on the wonderful Ciate London Glow-To Illuminating Blushers which may not be a new release, however, are definitely a firm favourite in my Spring makeup routine. All 5 shades are highlighter/blusher hybrid due to the marbled powder that gives a flush of highlighted colour that catches the light perfectly. The packaging is also out of this world pretty! If you want to grab a bargain you can find these stunning blushers for under £5 via eBay here! I highly recommend 'Matchmaker' for a peach glow and 'Baby Doll' for a raspberry pink glow. More Spring blusher recommendations: Glossier Cloud Paints, the Balm Frat Boy Blusher, Bourjois Aqua Blush and Benefit Coralista. There's nothing like a whipped weightless formula when it comes to makeup. These are generally foundations or cream eyeshadows that basically don't feel like they are on the skin at all. Perfect for light makeup days and when you just don't want your face to feel like it had makeup on it! My latest weight makeup discovery has been Glossier Lidstars which was first seen on Beyonce at this years Oscars, no less. So, of course, these glistening eye glows have been hotely anticipated! Out of the six shades I decided to pick up two, with Fawn & Cub, both shades I've been really pleased with. While I have a strong dislike of the packaging (why so cheap looking, Glossier?) the formula is spot on with, not only feeling like it isn't even on the skin but staying put all day long literally! 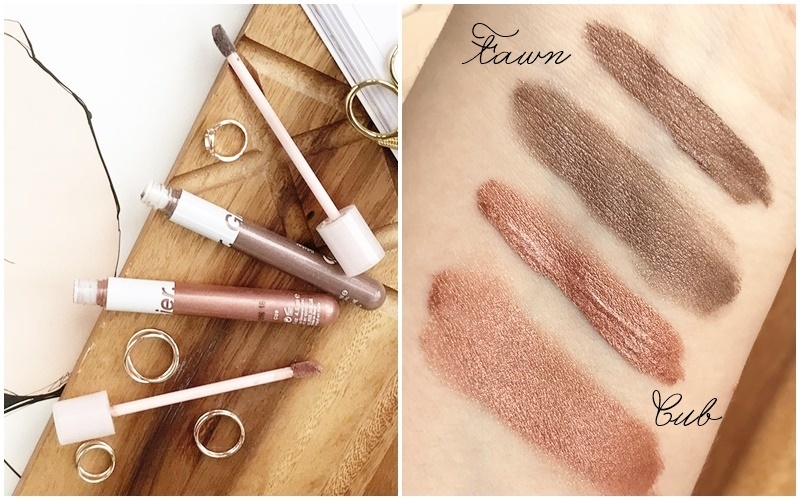 I decided on both Fawn & Cub as I had heard that the lighter shades appeared too sheer on the lids, especially when blending and while both of these shades can be sheered down when blending with fingertips I prefer to apply them with their doe foot applicators and lightly blend out the edges with a fluffy brush to keep that opaque colour on the lids. You can also mix Glossier Lidstars shades together to create your own unique shade, however, Fawn and Cub simply don't work well together I've found. At £15 each here or £25 for two here these aren't the cheapest of eyeshadows however due to their staying power and the fact they work well as a base I'm totally loving the two shades I picked up and know they will be seeing a lot of use this Spring/Summer. New Glossier customers can receive 10% off their order here! As this is just a look at what I've been changing up in my makeup routine I will be sure to share my Spring makeup bag very soon. Let me know what you like to add in or change up in your makeup bag once Spring hits!